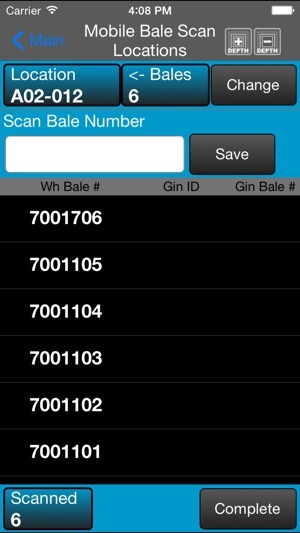 Mobile Bale Scan is an eCotton product from EWR, Inc.
*** Your warehouse must be subscribed to IsMyLoadReady.com (an eCotton service) in order for you to send or receive data with this app. We have tested with the Symbol LS3578-ER handheld scanner. Any scanner that supports the "HID" bluetooth profile should work with this app. Please contact us before purchasing a scanner to ensure compatibility. 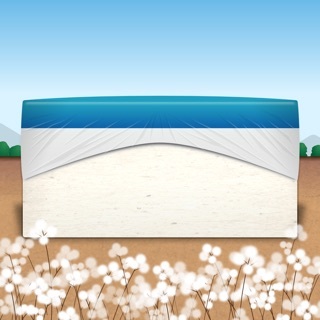 - Identify a location and then scan bales as they are stacked. When complete, data is uploaded to your eCotton Warehouse System wirelessly, so there's no need to dock the device or scanner in the office. - Select a shipping order to work with by scanning the shipping order or marks barcode, or select manually from a list. - Select an inbound mark to work with (from a list or scanned from a barcode), then match up PBI numbers with warehouse bale numbers. Even record damaged bales if you like, which can send an email with attached photo of the damaged bale. When complete, data is uploaded to your eCotton Warehouse System wirelessly...no docking of the device or scanner in the office, and no chance of losing a day's worth of work. - Accesses picking list data that is prepared by the eCotton Warehouse System. A list of bales to pick is presented, and bale numbers are verified as they are pulled from stock and scanned. 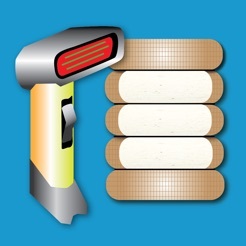 Picking lists can be divided and assigned to any number of workers or by equipment (forklift) ID. - For verifying bales that have been pulled from stock and are waiting on the floor to be moved to the staging area. 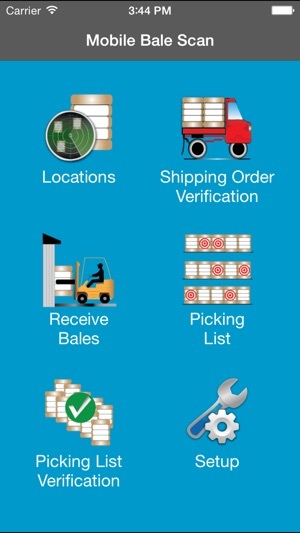 - Accesses picking list data that is prepared by the eCotton Warehouse System. 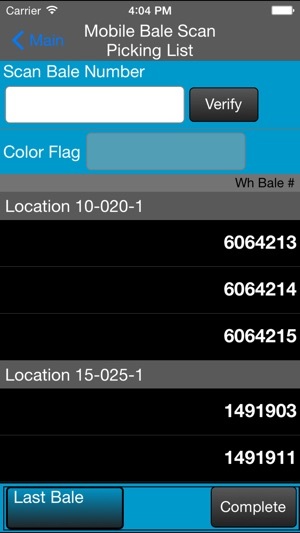 - As each bale is scanned, the Color Flag and Marks are displayed. Counters show your progress on each mark. - A mark can (optionally) be selected before scanning, causing any bales scanned that don't belong to that mark to generate a red screen flash and "bad" sound. - As each bale is scanned, the screen flashes green and makes a "good" sound for a good bale, and the screen flashes red and makes a "bad" sound for a bad bale (DOG). - This function can be exited at any time and resumed later. - As bales are scanned, the screen flashes green and makes a "good" sound for a good bale, and the screen flashes red and makes a "bad" sound for a bad bale (DOG). - View Shorts when done scanning. - Completion eMails can be automatically sent to warehouse management. - Can be installed on multiple devices for a single warehouse. 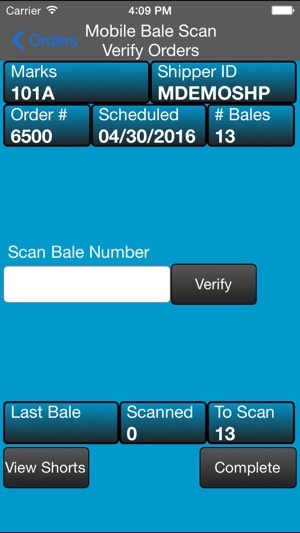 We are actively updating Mobile Bale Scan on a regular basis. 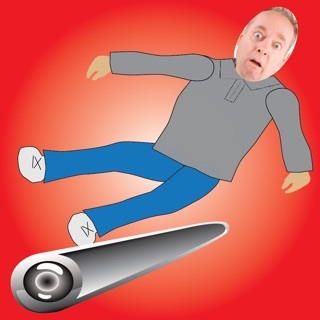 Please enable automatic updates so you'll have the latest features and best performance. 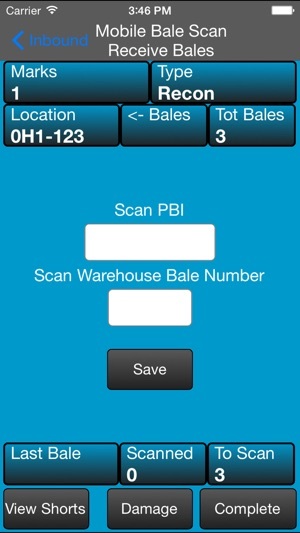 Adjustments to handle PBI scanning in the Picking List Verification screen, when using realtime updates. © 2012-2018 by EWR, Inc.